y contract ended the Friday before Thanksgiving week. It was pretty unexpected, but since I’ve done a lot contracting, sudden endings are not unusual. I made a definitive choice to not even look for another contract until after the new year, considering that many businesses don’t get much done – and don’t take on new work – from Thanksgiving through New Year’s Day. Sometimes not until the end of the first week of January. In order to really enjoy the time off, I knew it would be important to make the declaration and not be distracted. The more time that passed, the more time I was able to breathe. You know sometimes when you’re juggling multiple projects at work and a commute and traffic, and also managing a home and a child and budgets, you can become so stressed that sometimes you don’t know whether you’re coming or going. That’s when I knew I needed some more time. I did sit and really think through the ideal situation for my next project – if it is contract or full time. And it is as much and as important – maybe more important – that the company and the environment has to be right. Don’t get me wrong, I have worked for some of the most amazing and exciting people in my career. People who have taken me under their wing and taught me. Showed me the underside of the belly. These were men and women who believed in what they were doing and took the time to share it with me. I have also worked for companies that are leaders in the industry and who many people wished they had the opportunity to work with. Its been a great ride. So, what do I want next? Pretty much the same thing I have always wanted and which I mostly was given. New technology. Investment by these companies in the development of this technology. One that believes as much in their people as they do with their hardware and software. A company that invests in those that brave those daily commutes and time away from friends and family. That thinks that their people are the biggest assets, not numbers on a chart. Secondly, the embrace of the technology. I had the opportunity once to work for a company that quickly turned out to be hesitant – maybe resistant – to new technology. The best way to describe it was that they were firmly entrenched in the technology that I used twenty five years ago. And almost everything that had to do with this particular contract was centered not only on keeping that old technology working, but to actively resist any updates to anything new. Third, the company I work for must be open to ideas from the team. Sometimes the best idea is from someone who you would never guess had a suggestion. I have been lucky that I’ve been heard when offering ideas around an interface or process. Just because I work QA doesn’t mean that I can’t or don’t know about the users’ perspectives. After all, not only I do I work on technology, I am a user too. I think that this is the point where I am ready to start looking for the next big project. I think it is going to be exciting! esterday, The Kid and I went on a little adventure. For some time, The Kid has wanted to go camping. As we’re nearing the season – it has to at least be above fifty degrees overnight – we’re trying to find an acceptable place to go camping. Now, we’re not the drag along our entire house campers, we sleep in a tent and cook over a fire. Real camping. It has been about a hundred years ago since we last went camping. We were living in California and our favorite place to go was in the Sierra Nevada Mountains. Our spot was Kings Canyon National Forest and Sequoia National Forest… I stumbled on it long before The Kid was born, as I had been driving up the coast of California and just happened to pass a sign indicating “Grants Grove” up in the national forest. Something about seeing (at least part of) my name made me want to go check it out. This place is heaven on earth. The first time I visited, I opted to stay overnight in one of their cabins and it just happened to snow about 8 feet over night. And I am not exaggerating one bit. When I woke the next morning, all the cars in the small parking lot in front of the cabins were completely buried. Buried in the sense that not only could you not see the cars, you couldn’t see the outline of cars. You would never have any idea that there were eight cars out there. Best thing ever. I stayed five days and just fell in love with the place. The trees (giant sequoias in addition to the “ordinary” trees) and the fresh air, the beautiful meadow with wild animals and the crisp air; hell, just the solitude was amazing. Okay, got a little off track there. We made Kings/Sequoia our destination for 15 years, on and off. When my son was born, we used to head up there summer and winter! We’ve spent Easter and Thanksgiving and even one Christmas there. We loved it there. So, now that we’ve moved away from our beloved mountains and forests, we have to find a new destination. A few weeks ago, we headed to Pony Express Conservation Area, but it left us a little disappointed and we vowed to keep looking. So yesterday, we jumped into the car fairly early and headed out to check out a new destination. About 225 miles from Kansas City, we visited Long Branch Lake. Only one side of the lake had developed campsites, but to their credit, they did include ‘primitive’ campsites and even walk-in camp sites. 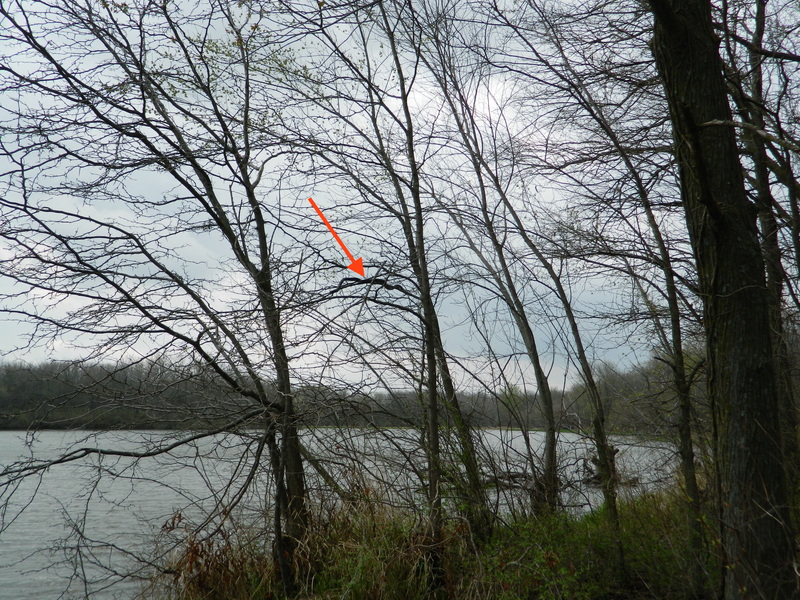 These were further back from the road and in wooded areas with very close access to the lake. These were pretty good as they provided everything that we were looking for and still had access to a real toilet! It was a bit of a walk, but still… these things can be important! We hung out for a while, enjoying the solace. The temperatures were around a high of 55 degrees, and being right on the water it was cool. We also attempted to drive around the lake, but much to our chagrin, we couldn’t find a road that went all the way around. We then drove in to the closest town, with a population of 5400, we drive around Macon, Missouri. They had all the basics one might need when camping and the folks seemed really friendly. It was awesome. After some lunch, we opted to head back. There is something about driving 560 miles in a day that is exhausting. But I can tell you that there is nothing more precious to me than spending quiet time with my son. Singing to the radio and really talking. These days and the time I spend with him are priceless. So, this place has risen to the top of the list of our sites for camping. We intend to keep looking, but we do plan to head to Long Branch this spring. We have gotten our camping stuff out of storage and made a quick inventory and list of stuff we need to purchase for our first camp out. And for sure we cannot forget the camera. Like we did yesterday. So, I didn’t get any pictures. I didn’t even think to take any with either of our phones! Doh! I guess this means we have to go back, just to get pics! Do Doctors Always Know Best? ust back from another doctor appointment. I am so frustrated with things, I am not sure where to even begin! For those who know me or read my blog, I suffer from chronic headaches and migraines – not the same things. I almost always have a headache – a dull aching throb that sort of is always there. Then, on occasion I get to experience what some may call a traditional migraine. I get those between 8 and 15 times a year. These are bad enough to actually knock me off my feet and can last several days. And how long have I been suffering with these ailments? Almost thirty years. Yes, you read that right, three decades. And in that span of time, I’ve managed to find three periods of respite. The first time was about 15 years ago, when I injured my knee. Actually, to be precise, it was when I re-injured my knee. The doc that I saw at the time didn’t see much more damage than was already there, so she subscribed an anti-inflammatory in the form of 800mg Ibuprofen. Not only did it work on the knee, but it did seem to give me some relief in the way of the headache. Not actually making it go away (or feel like it was gone), but took off the edge enough to be able to still function. This worked quite well for a well, and then it took larger and larger doses to gain the same amount of relief. It was only when it came to light just how many of these pills I was taking that the medical professional I was seeing immediately took me off it, lest the prescription damage my liver. The second time was, interestingly enough, when I was pregnant with my son. Interesting, as it took nearly five years for me to become pregnant and make it past the first trimester with the baby. Seven miscarriages would usually convince a woman to give up – and I nearly did – but the eighth time was a success. And for the duration of my pregnancy, I don’t believe that I suffered a single headache or migraine. Sometime later, after moving to Kansas City, came the third respite. This is where I met my current doctor, Dr. B. who is a pain management specialist. Actually, following kidney surgery, I was prescribed a fairly strong pain med and lo and behold, it actually helped immensely with my headache pain. So, for the last four or so years, I have been taking this medication largely with success. Even after all this time, it is still the best I have felt in the past thirty years. Granted, I have had some pain break through and it doesn’t do much towards a full blown migraine attack, but it does incredibly well with the chronic headaches. Which, of course, means that another doctor wants to change it. I have heard the warnings of rebound headaches; that the prescription could, in fact, cause headaches. I don’t think I’ve gotten to that point, and frankly I want to experience as much time as is possible before I do have to begin another search for relief. My neurologist is at the point where I would think that a doctor would start. Ignoring everything that came before, he is beginning his search at the beginning. ‘Cept I don’t want to start over from the beginning. There are some new avenues of research that could be fruitful, but right now, I am just not ready to give up on the narcotic regimen that I am on. I am more than sure that he simply would prefer not to have me taking a narcotic that has a high rate of dependency, but I think that is all neither here nor there. I think that I have long passed that line in the sand. So, even though I was supposed to do labs while I was there and schedule an appointment for a spinal tap, I opted not to. I don’t suppose that this will be received well, but this is a decision that is ultimately made by me. For me. And about me. he Kid and I had a bit of cabin fever today, so we opted to head out on a little adventure at the spur of the moment. We headed north from Kansas City, and towards a little area that we had checked out for possible camping in the near future. 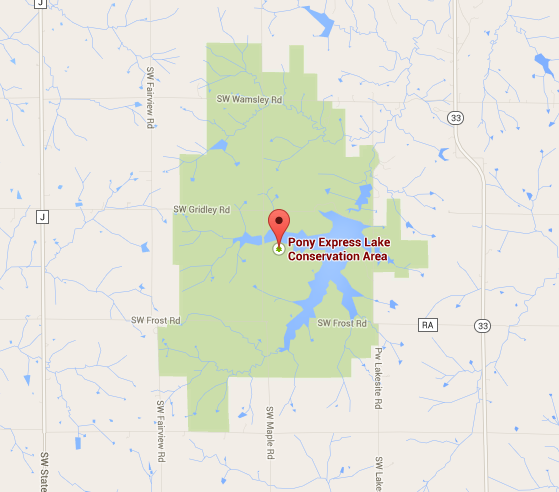 A small lake and forested area known as Pony Express Conservation Area, complete with its own lake. The weather was overcast and damp as a storm had rolled through the area last night. It all smelled of campfires (or maybe fireplaces) and the lake. As we walked to the waters edge, we were met by a small crowd of baby ducks, who hurriedly swam away from us. 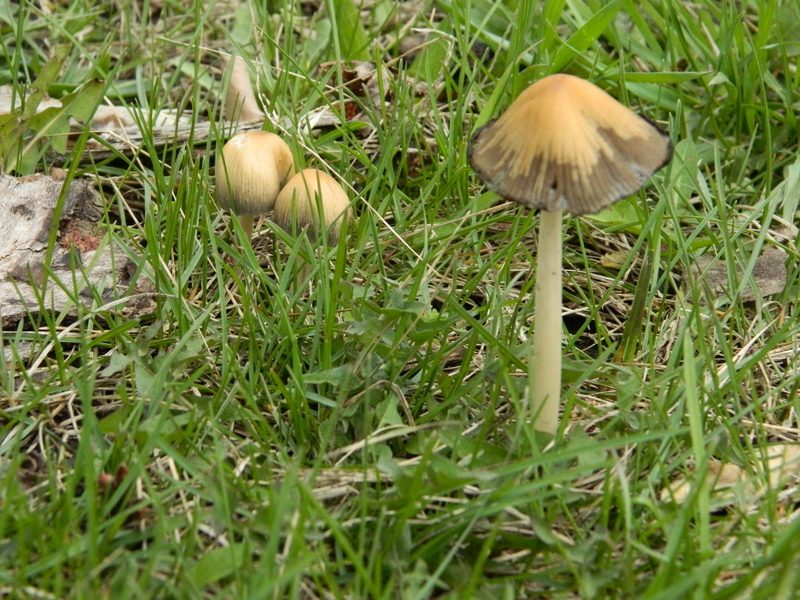 The dampness made the proliferation of mushrooms everywhere. 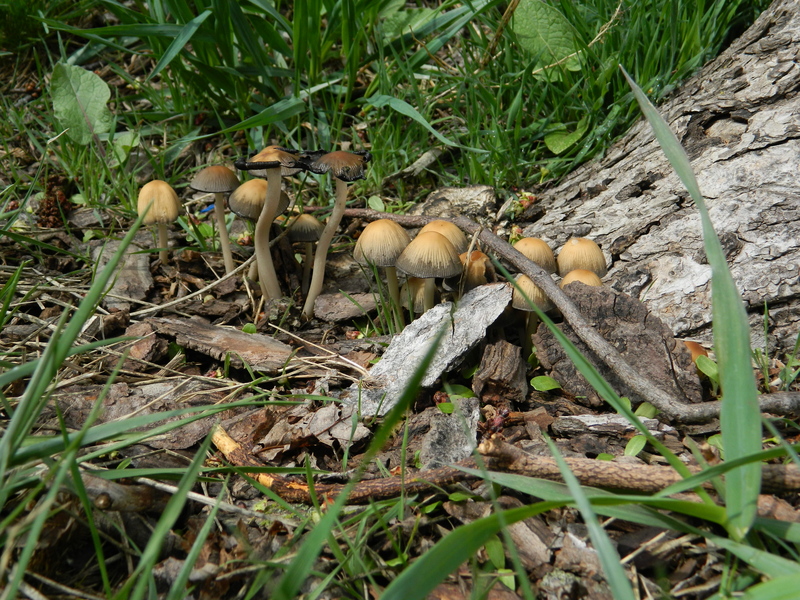 Clusters of mushrooms sprouted near the trees and the lake edge. There were all shapes and sizes; I don’t know much about mushrooms – except I don’t care for them on my pizza – but these hopefully would be food for the wildlife. And speaking of wildlife, here is one such example. 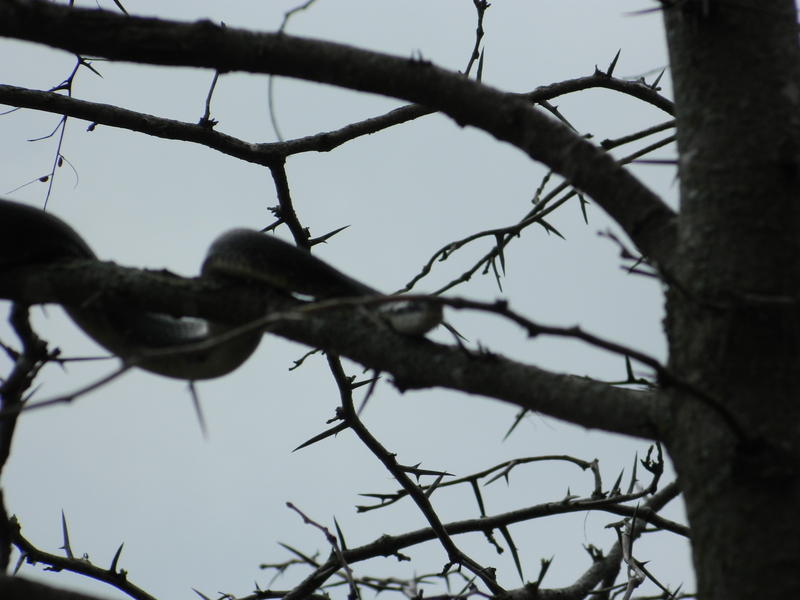 Did you know that snakes climb trees? I certainly didn’t. 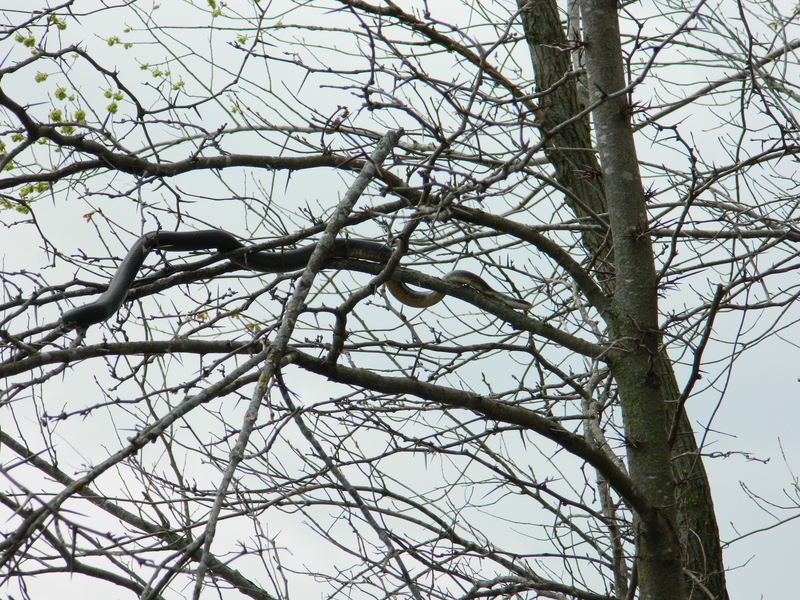 And when The Kid spotted this “large” branch in a tree, we both did a double take. As The Kid moved closer to the tree, though, another snake dropped out of another tree and that was all he needed to see to decide to keep his distance. There were tons of frogs and probably because of the damp weather, they were all out and croaking. We walked down the shoreline a little more and The Kid was swearing that he was getting ticks all over himself and I was wondering why in the world does this kid want to go camping? We’re going to another place further east in the state sometime next week to check out their primitive camp sites. We want to go where there are few people yet close enough to the basics of indoor plumbing and water. Everything seems so green and colors in the forms of trees, flowers and even weeds are finally convincing us that winter really might be over. Although Tuesday the high was almost 80 degrees and we turned the A/C on, although by nightfall and the overcast stormy weather blew in, we had to turn the heat on before we went to bed. The temperatures had dropped my nearly 35 degrees and now it was downright chilly! I think Mother Nature had a hot flash! follow a few blogs from folks who are living a similar stage of their lives. You know, the ‘over the hill’, done living most of life and now trying to figure out what should be done with what remaining time is left stage? I can’t say for certain, but I am pretty sure that we’re all over that magical ’50’ mark in the birthday count. I started this blog about the time I turned fifty. So, if you have any sense of numbers at all: yes, I am ‘over fifty’. And like most people who fill similar shoes as I do, I cannot ever remember a time when I believed that I would be at this point. Ha. Life has not slowed down for me. And I have been pretty intentional about making time not slow down. I realize that I cannot do all those things I once so took for granted (like staying up really late and still getting up really early) but that’s okay. I now look forward to doing with my life those things I used to spend making a life. I am not officially ‘retired’ but whoa, not having worked for the past few months is liberating. Well, in the sense that I don’t have to worry about money like I did before. Not quite as much as I did before, anyway. Isn’t that purpose of this portion of life? The first part was about family and a job and getting an education and starting a career and a family? I know it is so cliché to say that life has moved so quickly, but I guess there is a reason everyone says it! So, some folks at this stage are trying to hold onto their youth. Or extend the life they have left. Bravo to them. We should all be doing exactly what we want at this age. But I don’t fall into that camp – I am saying “to hell with it” and not worrying about a single calorie or lack of structured exercise or sleep routine. I am living each day to the fullest and that means not depriving myself of anything! And mostly that means around what I eat and how I sleep and in general, how I take care of myself. After all, I nearly killed myself doing that in the past, and deprived myself of perhaps some serious enjoyment. No longer. I have always been a morning person though. So, I still am up “early” most days. Of course, that word has different connotations for different people, so my “early” may be someone else’s “sleeping in”. (And of course it differs greatly from The Kid’s definition: he thinks ‘early’ means ‘before noon’). I think I wrote about this before, but this year will have some remarkable things happening for me. I have had my 20,000th day birthday, hit 400 posts on this blog (and 200 on my other) and shortly I will celebrate my 55th birthday. It is also the year that my birthday matches my age: May 5 (5/5) and age 55. And I will celebrate being a mother for 20 years. I like where this year is going. Hopefully, but the end of this year, I will have more concrete plans for moving to Europe or somewhere; I have never been one to stick around so long in any one place. So, thanks for taking the journey with me. However you define it for yourself.